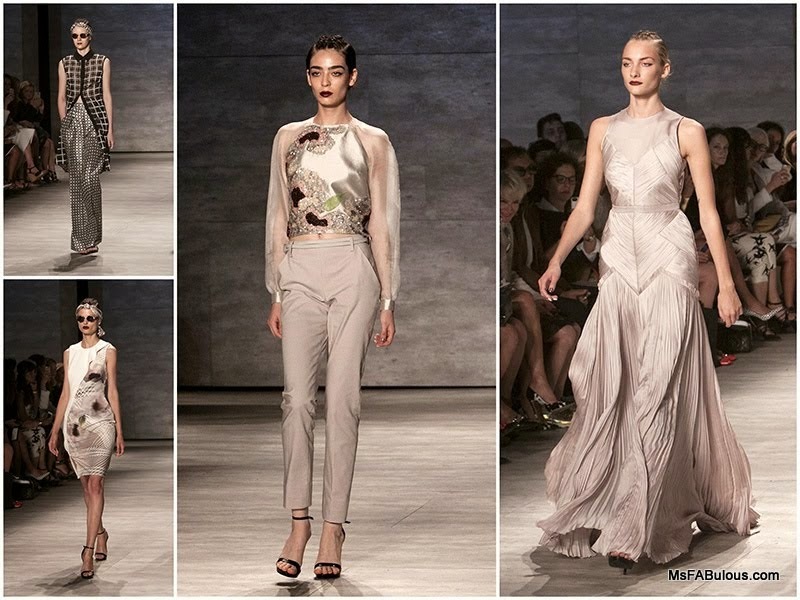 Bibhu Mohapatra’s spring 2015 collection was a tribute to heiress and activist Nancy Cunard. 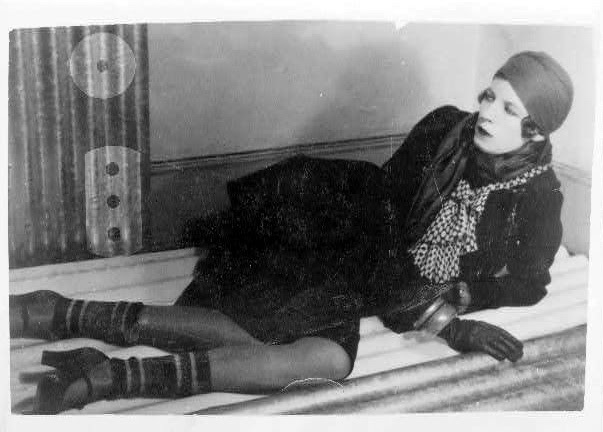 In addition to socializing with literary and artistic greats like Ezra Pound, Ernest Hemingway and Man Ray, she was an accomplished publisher on her own. She led the fight against racism and fascism as the new purpose in her life after falling in love with jazz musician Henry Crowder. While the rebellious spirit of the socialite was a muse for the designer, the aesthetics of the inspiration are a little more subtle. There were some 1920’s and 1930’s silhouettes. The turban styled hair, the bias pleat evening gowns had the glamour of madcap heiresses of old Hollywood movies. The oversized beaded flower motifs paired with pale pink satin reminded me of Paul Poiret in the decade before that. The color palette was stark, with black, ivory, pale blue and orange when it was mixed with a geometric pattern. This wicker basket-like print was interpreted in different scales and distorted across luxury fabrics. The softer rose and red colors were reserved for the embroidered styles. I don’t know why we don’t see his gowns on the red carpet during awards season. They are so beautiful and elegant. Each collection has an artistic edge to them that many other collections just don’t achieve. Bibhu Mohapatra’s star has risen quickly in recent seasons. Unfortunately, he seems to have attracted unwanted attention too. Many photographers were offended when they were thoroughly searched by security before being allowed to shoot this show. We were told by guards that the designer felt threatened. Credentialed photographers have to send in their body of work and assignments in order to be approved. They have to show official forms of identification in order to pick up their credentials, all of which have a photo and full name. Most have been photographing fashion week for years. However, all sorts of random guests who only need a barcode to gain entry to the show, with no identification checked or required, carrying large handbags were all let into the venue without a second glance. Now, unless someone received a specific tip that a credentialed photographer was the threat, why would you treat them like criminals yet let all the strangers and random “fans” into the fashion show? Of course, the fashion show guests are generally better heeled (they don’t have to stand for 14 hours with 50 lbs. of equipment on their shoulder). They also have designer labels on their bags as opposed to bags that carry professional gear. This was clearly a case of class/style discrimination. If you were a stalker who meant harm, which route would YOU take? Easy, random, unchecked guest ticket that you could buy on Craigslist, or spend years building up credentials to be a photographer? Also, will 99% of the world see your work from photographs or in person at the show? Do you really want to offend those who take and distribute those photographs?